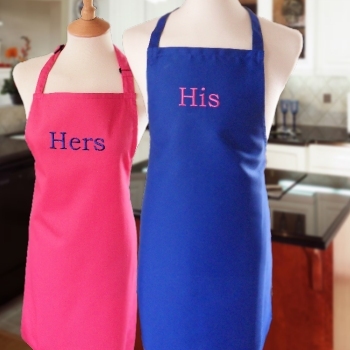 A unique gift set of two aprons ideal for a his and hers gift for an anniversary, wedding, Christmas present or housewarming gift set. These quality chefs aprons are made from 65% cotton and 35% polyester and is fully machine washable with similar colours. Adjustable neck strap with long waist ties makes an easy fit for most adults. Apron body size 72 x 86cm. Please allow approx 48 hours for personalised gifts to be made to order.